A1: In general, you'll receive the order confirmation e-mail within one hour after the payment has processed. In the confirmation e-mail you will find software download link and register information. You should also check your SPAM folder. If you do not receive the confirmation e-mail even after 12 hours, please contact Support Center and attach your order receipt. We will reply within 48 hours. Q2: : How to register Tenorshare software? A2: ake Any iOS Data Recovery for example. 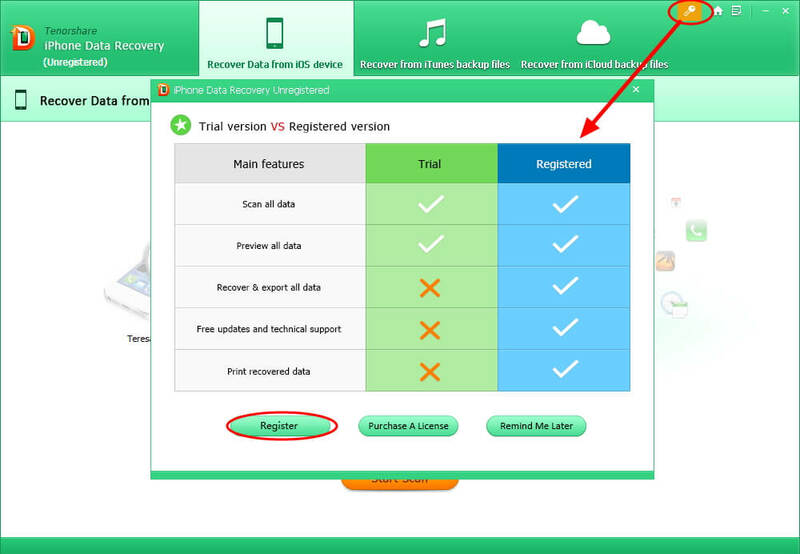 Click the key icon on the top right menu of Any iOS Data Recovery, and click Register option in the popup window. In the Register window, please enter the License Email and License Code (Registration Code) that you receive in the confirmation e-mail. Both License Email and code are case sensitive, you’d better copy&paste and delete the trailing blank. You should use the provided License Email to register, NOT your own Email address. If you purchased a Mac product, please install the program to the Applications folder on Mac, and open the software from the Applications folder. If not, you cannot register successfully. You can download the software by clicking “Click here” button in the order confirmation e-mail. That link is valid within 14 days and only for three downloads. If you exceed the time period and three downloads, please go to Tenorshare official website to download your product. The “Click here” link is full activated version already for Windows Password Recovery Tools, WinPE, Windows Boot Genius, and Fix Genius. It is no need to register these products after installation. If you exceed maximum downloads for these products, please write to support team to request full download link. Both License Email and Code are case sensitive, you'd better copy&paste directly to the proper text boxes in the register window and delete the trailing blank. If these still do not help, please submit an online ticket and attach your order receipt. We will reply within 48 hours.